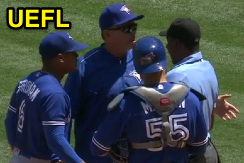 HP Umpire Ramon De Jesus ejected Blue Jays Manager John Gibbons (Illegal Quick Pitch, automatic ball call) in the bottom of the 3rd inning of the Blue Jays-Angels game. With two out and none on, Angels batter Kole Calhoun prepared to receive a 3-1 pitch from Blue Jays pitcher Marcus Stroman. Replays indicate that Stroman began his delivery prior to Calhoun becoming set in the batter's box, resulting in a quick pitch ruling and automatic ball, the fourth ball of Calhoun's at-bat, the call was correct. * At the time of the ejection, the game was tied, 0-0. The Blue Jays ultimately won the contest, 6-2. This is Ramon De Jesus (18)'s first ejection of the 2017 MLB regular season. Ramon De Jesus now has 5 points in the UEFL Standings (0 Previous + 3 AAA + 2 Correct Call = 5). Crew Chief Alfonso Marquez now has 2 points in Crew Division (1 Previous + 1 Correct Call = 2). *Rule 5.07(a)(2) Comment states, in part, "if, however, in the umpire’s judgment, a pitcher delivers the ball in a deliberate effort to catch the batter off guard, this delivery shall be deemed a quick pitch, for which the penalty is a ball." Rule 6.02(a)(5) Comment states, "A quick pitch is an illegal pitch. Umpires will judge a quick pitch as one delivered before the batter is reasonably set in the batter’s box. With runners on base the penalty is a balk; with no runners on base, it is a ball. The quick pitch is dangerous and should not be permitted." Rule 6.02(b) states, "If the pitcher makes an illegal pitch with the bases unoccupied, it shall be called a ball unless the batter reaches first base on a hit, an error, a base on balls, a hit batter or otherwise." This is the 16th ejection report of 2017. This is the 9th Manager ejection of 2017. This is Toronto's 1st ejection of 2017, 2nd in the AL East (BOS, TB 2; TOR 1; BAL, NYY 0). This is John Gibbons' 1st ejection since September 11, 2016 (Jim Joyce; QOC = Y [Replay Review]). This is Ramon De Jesus' 1st ejection since Sept 13, 2016 (Tim Wallach; QOC = Y [Balls/Strikes]). Wrap: Toronto Blue Jays vs. Los Angeles Angels of Anaheim, 4/23/17 | Video via "Read More"